The goal of merging two companies should be to create synergy that helps both businesses and their values grow and be more successful than the two could individually. By merging in to one, the companies will benefit from the economy of scale, resulting in cost savings, business growth, potential tax benefits, an increase in market reach and potential revenue enhancement. As a business attorney in Kansas City, I believe that successful transactions need thorough checklists and documentation. It is my goal to memorialize the expectations of the parties, and to make sure that the transaction process is as smooth as possible. For example, although I’ve come across some transactions that have a simultaneous signing and closing, most transactions have the closing a period of time after the signing. There can be several regulatory, corporate, and third-party consents that need to be obtained before completing the transaction. The parties may not want to begin the process of obtaining these consents until they have a signed agreement, particularly on the seller side. The first step towards a successful closing is creating a comprehensive closing checklist for the transaction. This is a list that assigns responsibility for actions to be taken and documents to be delivered at, on, or before the closing. The checklist is important for an organized closing and should be done as early in the process as possible. 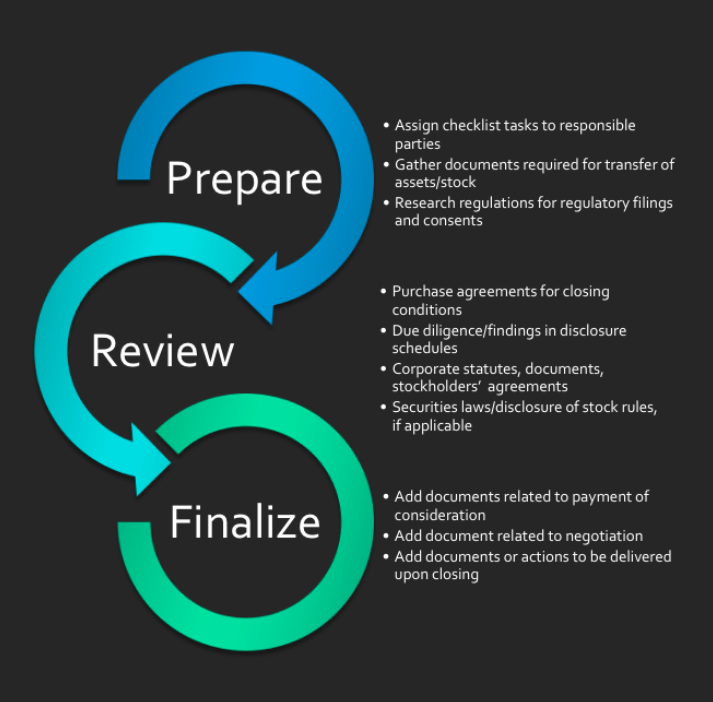 Here is a summarized recommendation of tips for closing that I’ve found in my business law experience to have streamlined the closing process. If you’re looking to Merge with or Acquire a business in the Kansas City area and need a business lawyer in Kansas City, call Jeff today. *The information presented in this article does not constitute legal advice and is not intended to create an attorney-client relationship.